Create powerful point clouds and 3D meshes using our newest flight mode. Plan your flight, set your altitudes, and let the drone and camera work autonomously to capture the optimal pictures for your scan. Perimeter Scan is an advanced flight mode. Before flying Perimeter Scan please carefully read the safety guidelines and instructions. Always maintain line-of-sight when the vehicle is in air. Use a visual observer to maintain line-of-sight. Identify obstacles like power lines, towers, cranes, and trees before taking off. Flying at altitudes below the height of the point of interest adds additional risk. To ensure a safe and successful Perimeter Scan, identify any hazards or obstacles around your site. 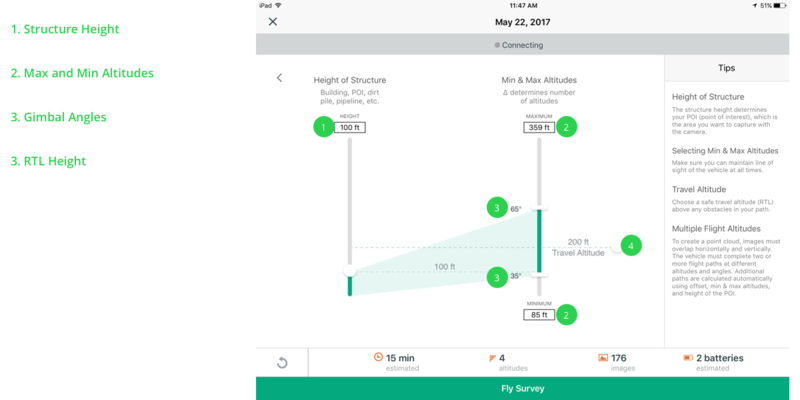 Evaluate a safe height for RTL (return to launch), which you will enter when planning the flight. 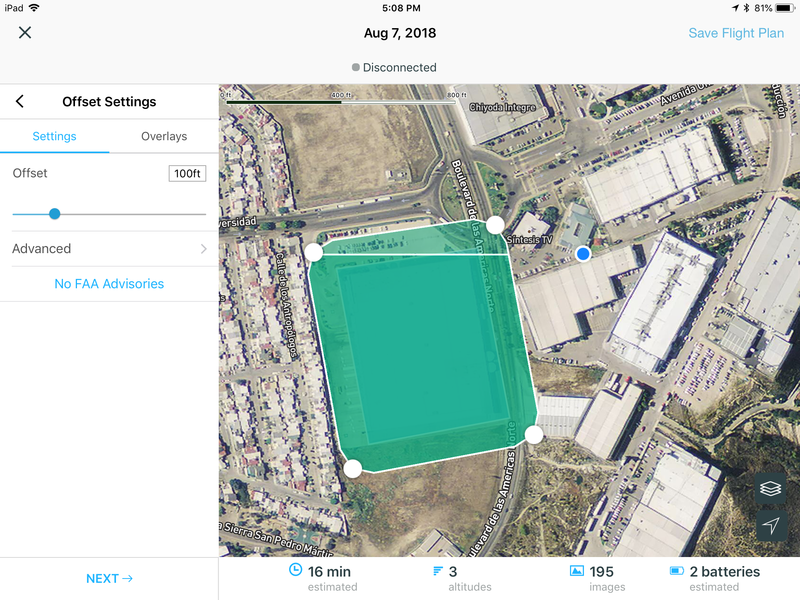 After evaluating the area, open the Site Scan Field, select a project, and tap Perimeter Scan from the flight modes screen. The region of interest (ROI) defines the perimeter that you would like to scan. The actual flight path is generated with an initial offset of 100’, with a minimum of 50′. The default offset reduces the risk of colliding into vertical structures. The structure height is the top of the area you want to scan. After setting the height, adjust the maximum and minimum altitudes. As a rule of thumb, adjust the altitudes so the gimbal angles are 65° (max altitude) and 35° (min altitude). The gimbal angle values are on the left side of the altitude slider. After setting the structure height and making any adjustments to the altitudes, confirm the flight path and settings on the next screen. The preflight checklist will run, ensuring that you have a safe and successful flight. The vehicle will be changing altitudes, from the top to bottom, as it completes rings at each altitude. The vehicle will also stop in place to capture panorama shots for sharp angles. Make sure to use a visual observer if the vehicle will fly outside of your line-of-sight. If anything goes wrong you can return home at any time. Upload your job to the cloud and begin processing. Once the job has been processed you will have high-quality point clouds (.las, .rcs) and 3D meshes (.obj, .rcm) that can be exported and used in Autodesk tools like Civil 3D, ReCap Pro, and Remake.